The Multilin DGCS is an advanced Controller for detection of faults and controlling overhead and pad mounted switches. The DGCS is compatible with most switches and provides a great degree of flexibility in integrating with FDIR systems. A key driver and measurement of utility effectiveness is in the reliability of power to its customers. As many faults on overhead distribution lines are transient in nature, reclosing at the substation and installation of mid-line reclosers./switches can improve a utilities SAIDI reliability index by up to 24%. When permanent faults occur on overhead lines, having feeders with increasing degrees or automation can greatly enhance distribution grid reliability and reduce restoration of unfaulted segments from several hours to a few seconds or minutes. 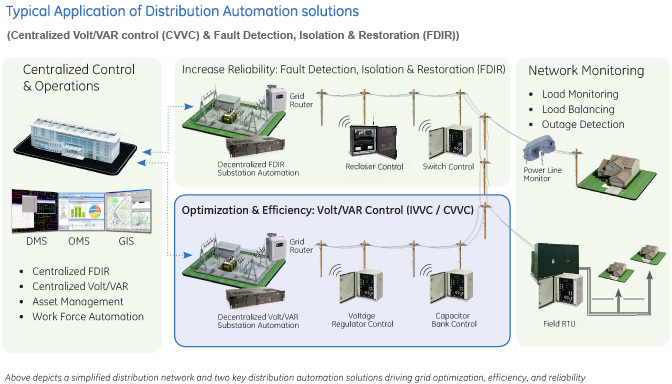 A key component of these automation schemes is intelligent controllers that can integrate with FDIR systems through sharing local information and accepting control commands. Based on GE's proven controller platform with tens of thousands of units installed globally, the Multilin DGCS undergoes extensive Accelerated Life Testing (ALT) and Highly Accelerated Life Testing (HALT) to validate accurate functionality under specified conditions and to ensure accurate performance in extreme operating conditions and harsh environments. The Multilin DGCS offers powerful I/O and programmable logic (FlexLogic™) options for advanced automation and control, reducing the need and costs associated with additional programmable controllers or discrete control devices. For both operational efficiency and reliability reasons, the Multilin DGCS provides remote control for operating switchgear. 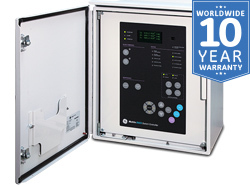 The Multilin DGCS is capable of providing both local and manual control of the switchgear. The Multilin DGCS has three identical set point groups. The activation of the group can be done either from the HMI or via a digital input. The Multilin DGCS provides 32 virtual inputs and 32 virtual outputs that provide users with the ability to send commands to the device. 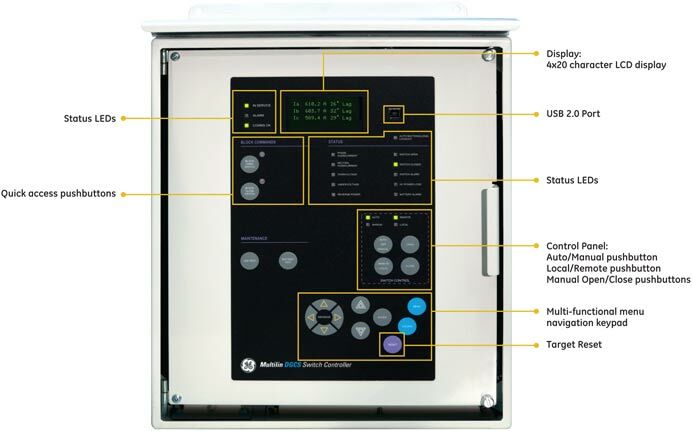 The Multilin DGCS can accept commands from SCADA, through the front HMI, or front USB port to issue commands such as close or open. The Multilin DGCS has the ability to force commands from the menu structure. This can also be achieved via the EnerVista™ software that runs on a PC. This simulation ensures that the close and open commands can be safely issued from a distance without using the HMI. These data points can be easily integrated into a customer's database for seamless viewing through a SCADA or DMS system like GE's PowerOn or GeNe. The maintenance elements in the Multilin DGCS provides alarms to the system based on the maximum number of closing/opening executed commands per period of time and I²t measurements per feeder. Comprehensive device health diagnostic tests are performed by the Multilin DGCS during startup and continuously at runtime to test its own major functions and critical hardware User Interface. The DGCS and associated software tools provide a suite of security features that ensure only approved personnel can make changes to the device configuration or execute operational commands.